"Short Swimmers" and "Long Swimmers"
We were drifting down the Zambezi below Victoria Falls when I heard the roar and recalled our guides warning. "If youre in an oar raft, you will probably go swimming. If youre in a paddle raft, you will definitely go swimming. If your raft flips over and you manage to grab the safety line, youre a short swimmer. If you miss it, youre a long swimmer."
The 24 Class IV - V+ rapids on the Batoka Gorge section of the Zambezi have earned it the reputation for being the most adrenaline-charged, one-day, commercial whitewater raft trip in the world, and we were about to discover why the river had been nicknamed the "Slambezi." Sitting on the veranda of the Ilala Lodge the day before, we had looked out across the manicured lawn to what appeared to be the smoke of a fire accompanied by a freight-train rumble. It wasnt a fire or train. 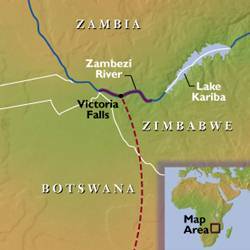 It was "Mosi-oa-tunya," the "smoking thunder" of Victoria Falls. We had followed the sound into Victoria Falls National Park, hiking through a rain forest of palm, strangler fig, and mahogany trees. Orchids bloomed in the branches, and ferns and moss carpeted the trail. Baboons screeched in the treetops as warthogs scurried out of sight and waterbucks watched our every move. At Devils Cataract we hiked down the slippery stones stairs to the overlook. Two hundred feet past the framing thorn bush, the sluggish Zambezi poured over the lip of the gorge, regaining all of its strength as it fell 350 feet, exploding with a deafening roar on the rocks below. The impact sent mist billowing hundreds of feet in the air, drenching us to the bone and forming perfect double rainbows. We were reminded that the Zambesis high-water rate of 250,000 cubic feet per second is 30 times that of the Colorado River as it enters the Grand Canyon. We hiked to the end of the mile-long first gorge to Danger Point and looked down on aptly named "Boiling Pot" where a 39-foot channel drops into the second gorge, Batoka. From our vantage point we could see the river pick up speed as it wedged through the venturi and slam into the rocks of rapid number 1. 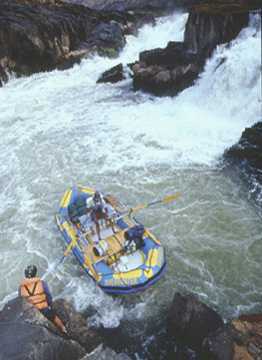 The fact that the rapid was only rated a Class IV made us reconsider the wisdom of the following days whitewater trip. We knew the roars name. It was rapid number 4, "Morning Glory," a Class V rapid. "Oh God!" We were about to plunge seven feet into the maw of a ten-foot standing wave. The four in the front of our raft stacked themselves like cordwood on the bow as we dropped into the hole. The three of us behind our guide hung on to the safety line and prayed. Cephas pulled mightily at his 10-foot oars until the last possible second as the four on the bow disappeared into the maelstrom. Cephas paddling and the speed we gained from the drop catapulted us through the face of the standing wave. We were through the worst of "Morning Glory," and as we paced the "long swimmers" from the paddle rafts, safety kayakers zoomed in to keep an eye on them until they bobbed into the eddy. We caught a break on rapid number 6, "Devils Toilet Bowl," a Class IV. With a drop in category a number of oar rafts put their most adrenaline-driven thrill seekers over the side on 2 x 3 pieces of Styrofoam, and while their in-water guide and a rescue kayaker kept an eye on them, they surfed the rapids standing waves. Cephas gave wide berth to the "keeper" hole for which the rapid is named and picked a clean line through the rest of the rapid. When the roar started again, all the bodysurfers were recalled to the relative safety of their rafts. We were headed into rapid number 7, "Gullivers Travels," a very nasty Class V+. 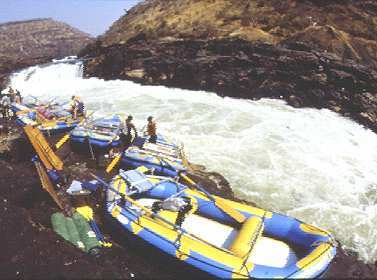 The gorge narrowed and funneled the Zambezi into a twisting chute with rocky headlands on each zig and zag. The waves werent that high, but the line through the rapid called for critical alignment and precise timing. All the rafts ran the top section without incident and pulled into an eddy above the bottom section. On any given day, high water or low, there are stretches of the river that are just too risky to run. That day it was lower "Gullivers," and all the crews were put ashore to scramble over the scree field at the base of the sheer canyon wall while the guides handled the empty rafts. Back on the river, we spotted roiling whitewater from one side of the gorge to the other. We were bearing down on "Midnight Diner." Rapid number 8 gave us three options. The left and right sides are rated Class 3+, but the center, "The Muncher," is rated a Class V because it drops into a deep, raft-taking hole that likes to chew its food well. We chose the right side and eddied out to watch the carnage of the rafts that chose to run the "The Muncher." One by one they were sucked in, bent, bounced, bumped, and flipped. While the kayakers stood by, the "long swimmers" were spit out of its hole and bobbed into the eddy. When Richard Bangs of Mountain Travel Sobek made the first decent through the Batoka Gorge in 1981, he noted in his journal that rapid number 9 was the most monstrous rapid he had ever seen. He deemed it a Class VI, called it "unrunable" and portaged around it. To this day all crews portage with their rafts around "Commercial Suicide." "Keeper" holes are often named for the size of an object that could be sucked into them. Rapid number 11, "Overland Truck Eater," seemed appropriately named. The hole of this Class V rapid was nearly as wide as the river, and Cephas bent to his oars to set up a line that would sweep us around its lip and "sling shot" us downriver. As we rimmed the hole, I looked down into its maw and saw a swirling galaxy of whitewater. Cephas got us past it, but many of the other rafts werent as lucky. One after another they disappeared into its vortex like fruit being dropped into a running blender. The kayakers really earned their money dashing into the hole to pull out swirling rafters. Holding Our Breath for "Three Ugly Sisters"
When I moved forward after lunch, the total weight in the bow was over 800 lbs., and we hoped it would be enough to keep the raft from flipping over backwards as we approached rapid number 12, "Three Ugly Sisters." The rapid was named for the three enormous and unavoidable standing waves that lined up one after the other. The four of us in the bow took a deep breath as we disappeared into the maelstrom at the bottom of the drop. "One thousand one, one thousand two, one thousand three, one thousand four..."
Finally, there was daylight and a chance to catch a quick breath before we "roller-coastered" into the bottom of sister number two. Another four-count, another quick breath, another four-count, and we were through it. By late afternoon we had run all nineteen rapids and pulled into the take out, spooking a 3-foot crocodile that was sunning itself on the bank. 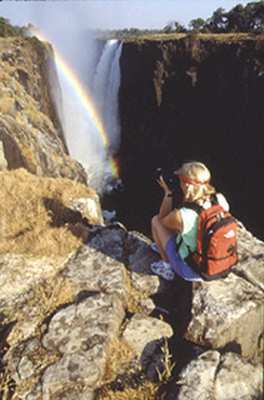 We had survived the Zambezi, and if we could survive the 700-foot climb to the top of the gorge, we were home free. Our adrenalin high and the promise of ice-cold beer pulled us through the climb. None of us was questioning whether or not Batoka Gorge had earned its reputation. Courtesy: Mountain Travel Sobek [Mountain Travel Sobeks "Ultimate Zambezi River Safari" captures the magic of Africa while rafting the wild, beating soul of the Zambezi River - from the open waterways and shady creeks of the upper river with its wildlife menagerie to the churning rapids below Victoria Falls, second to none in whitewater rafting excitement, and aptly coined the "Slambezi." Click here for more information on this adventure.